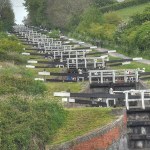 This weekend I took a trip to the Wiltshire town of Devizes to check out the flight of locks at Caen Hill. Altogether there are 29 locks which take the Kennet and Avon canal up a steep hill in to Devizes. The engineering is quite remarkable and there were plenty of people enjoying the fully restored system.